I love quick sketches and a wash of watercolor to give it color & depth. I always intend to sketch while I’m on holidays but for some reason, I never do. Today, I decided to pull out my supplies and do a quick little sketch of the first item on my craft table. 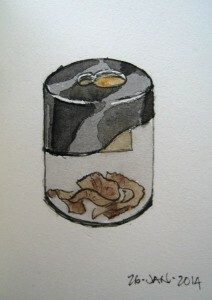 I just signed up for a Craftsy Mixed Media: Pen, Ink & Watercolor course. Hopefully, this will kick start my sketching.